During a typical year most lawns will be perfectly able to survive without irrigation for about 8 months. 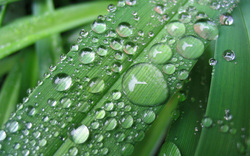 During dry periods it might be necessary to apply water to your lawn. 85% of the turfgrass plant is water. Irrigation is to put water back into the soil but excessive watering can lead to as many problems as not watering. How Much Water And When? When the effects of drought can be seen it is time to irrigate. The grass will change colour and possibly not stand up, due to lack of water in its cells. The speed in which water stress shows will depend on the type of soil. Sandy soil drains quicker so will lose water quicker. Generally heavy infrequent applications of water are better. This will encourage deep roots, discourage disease and aid plant health. A slight deficiency of water is not a bad thing as it can encourage deep and healthy root growth. The best time scale for watering during drought times is a heavy application once every 7-10 days with lighter applications every third day. Ensure that you water your lawn early in the morning rather than during the day or in the evening. Please do not cut the grass too short during the warmer weeks. It is important that you start watering your lawn before it begins to dry out.